Southbound: Photographs of and about the New South is a groundbreaking photography exhibition that provides fresh perspectives of the culture that constitutes today’s New South. It is composed of fifty-six photographers who have confronted and redefined the preconceived notions and stereotypes that come along with the region. One specific artist featured in Southbound who stands out is Kyle Ford. Ford is a Hong Kong-based photographer who explores how humans interface with the natural world. One of his images in particular, Shamu, SeaWorld Florida, 2009 captures American commercialism and the world’s largest industry: tourism. At first, I noticed that the photograph was taken in an earlier era due to the fact that tourists were holding VHS camcorders rather than cellphones. I appreciate the humor that Ford captured – featuring sightseers wearing pink cowboy hats, wearing “splash-zone” ponchos. The composition and balance in this photograph are spectacular; however, it is what lays beneath the surface that makes this image so powerful. At the turn of the twenty-first century, Florida endured demographic, social, and economic changes that generated famous tourist attractions such as Disney’s Animal Kingdom and SeaWorld. Since then, revealing documentaries, such as Blackfish, have unveiled the cruel reality of animal abuse behind American tourism, causing protests across the nation. Due to the disapproval of animal cruelty, Sea World and other once popular attractions have quickly begun to vanish. Ford encapsulates what was once desired and investigates American consumerism through his series of striking images. Shamu features documentary elements as well as an overall evident aesthetic. This image represents American culture, tourism, and the commercialism affecting our nation. 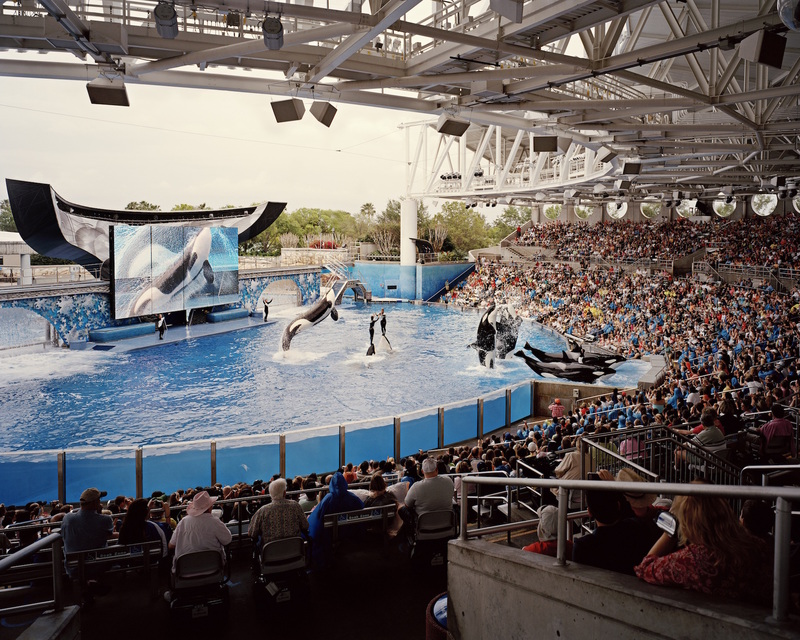 image credit: Kyle Ford, Shamu, SeaWorld, Florida, 2009, from the series Second Nature.